The National Law Journal has vetted Lubin & Meyer PC as a finalist in its 2015 Elite Practice Awards as part of its 2015 Elite Trial Lawyers Awards. Lubin & Meyer is selected in the Medical Malpractice category. Finalists are chosen by the editorial staff who review nomination submissions of law firms and plaintiffs lawyers who have positively impacted their practice area. 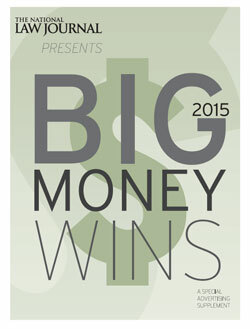 In addition, the National Law Journal's "Big Money Wins" publication ranked Lubin & Meyer's $35.4 million verdict in the Larkin v. Johnston trial as the 20th largest verdict in the entire country, and #1 in Massachusetts for 2015. Attorney Benjamin Novtony was the lead attorney representing the client in the birth injury case that involved an incomplete "problem list" resulting in a mother's stroke shortly after childbirth leaving her permanently paralyzed. The verdict was covered by Boston media; see more on the case here: $35.4M Verdict in Childbirth Stroke Lawsuit. The National Law Journal's Trial Lawyer Awards honor the Top 50 law firms in the country based on the top verdict and settlement amounts from the NLJ VerdictSearch, as well as the firms who represented the most cases from July 1, 2014 through June 30, 2015. The qualifications are as follows: Over $40M in awards during the year; or four or more cases totaling over $15M in awards during the year. Lubin & Meyer PC is based in Boston, Massachusetts, with attorneys licensed to practice in Massachusetts, New Hampshire and Rhode Island.